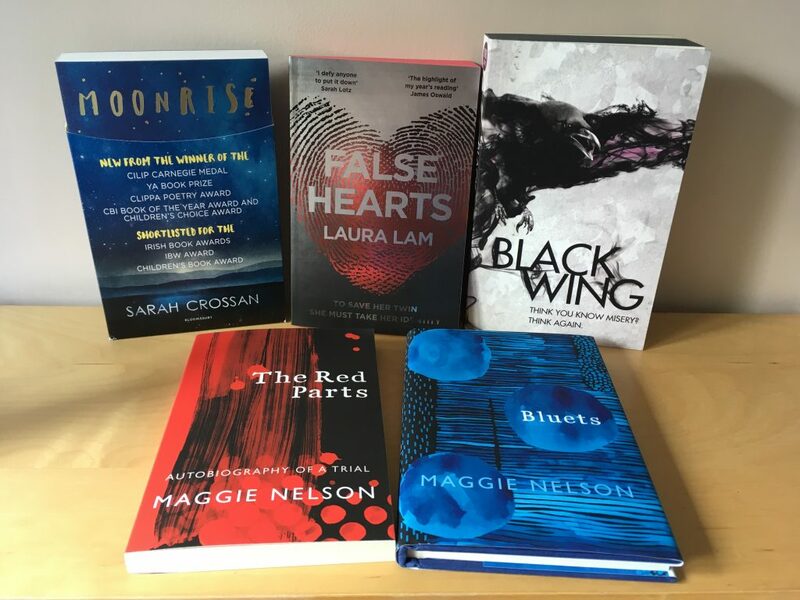 I’m going against type here by choosing a TBR coz by nature im a mood reader but I badly need to read some of the gorgeous proofs I get sent and these five are making my mouth water in a BIG way! I asked those gorgeous folk at Vintage Books for a copy of Bluets and The Red Parts by Maggie Nelson and they kindly sent them to me. They are both published tomorrow 1st June. Look how bloody lovely those covers are too. Stevie over at Gollancz very kindly sent me Black Wing by Ed McDonald after i requested a copy. It has gosh darn wonderful black sprayed edges and the story sounds quite thrilling. False Hearts by Laura Lam is another gorgeous book and one I have long been waiting for to arrive in paperback form. Another sprayed edge beauty, this time in red. I really cant wait to dive in to this one. And last but never least Moonrise by Sarah Crossan. I was beyond thrilled to get a copy of this from the splendid folk at Bloomsbury. I adored Sarah’s book One which i read in 2015 i think so cant wait to start this one. Its published in July. Well there you have it on paper. I have stated five books I want to read in June. See you back here in one month to see how well i did. Victoria sponge holds no fears for me now!